"Extraterrestrial" (90 minutes) premieres simultaneously on June 15th on DVD and all major on-demand platforms. It also opens June 15th in limited theatrical release. If you've seen the 2007 thriller "Timecrimes," you already know that Spanish writer-director Nacho Vigalondo has a noteworthy knack for developing big ideas (in this case, time travel) on an intimate scale. "Timecrimes" marked a promising debut, with Vigalondo in full command of limited resources: With only three central characters and a tightly restricted location, he executed a cleverly conceived plot with stylish economy and Hitchcockian flair. 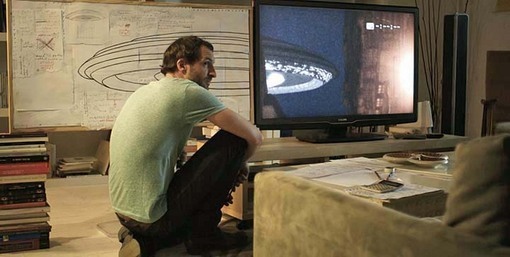 With his second film, "Extraterrestrial, " Vigalondo presents another, more intricate exercise in thwarting expectations. Imagine the bloated-budget excess of a blockbuster like "Independence Day," with dozens, maybe even hundreds of gigantic alien spaceships hovering ominously over Earth's major cities. Now take the same alien invasion scenario, eliminate 99% of the special effects and spectacle, and shift its focus to four lovelorn apartment dwellers in an abandoned city (in this case Madrid) as they proceed to confuse each other with a comedic succession of lies. Now you've got "Extraterrestrial," in which the only E. T. is... well, I'm not going to spoil it for you, but here's a clue: Think of Vigalondo as the anti-Roland Emmerich. He has no apparent interest in epic battles requiring Will Smith to save the world against slimy, monstrous aliens. Instead, Vigalondo attempts an audacious bait-and-switch, keeping his "epic" sci-fi entirely in the background while focusing on what is, essentially, a farcical rom-com about three guys in love with the same woman. It's a daring attempt at genre-bending that doesn't always pay off, but it's a refreshing alternative to uninspired, play-it-safe blockbusters. The woman is the young and lovely Julia (Michelle Jenner), who has just shared her bed with Julio (Julián Villagrán) after a mutually pleasurable one-night stand. They partied hard the night before: They can't remember each others' names or how they met, and they're about to get a wake-up surprise: Madrid has been evacuated overnight, and now there's a massive, four-mile-wide alien spaceship hovering over the city. It seems like we might be veering into "Cloverfield" territory, but when Julia's boyfriend Carlos arrives with details about the apparent "invasion," Vigalondo's straight-faced burlesque begins: Julia has to lie about the night before, taking advantage of Carlos's too-trusting nature; Carlos eventually lies to save face with Julia; Julio repeatedly lies to both of them to keep a major secret of his own; and Julia's nerdy, secretly smitten neighbor Angel (Carlos Areces) is a chronic eavesdropper who jealously threatens to blow everyone's cover. All of this suggests the structure of a door-slamming farce, with four characters running circles around one another while protecting their own hidden agendas. Yet again, Vigalondo steers clear of the obvious, but the result is a film with an identity crisis, which might explain its mixed reception at last year's Toronto Film Festival: "Extraterrestrial" is being promoted as "a hilarious science fiction comedy," but the comedy is so bone-dry that it barely earns a chuckle or two, and the science fiction, as already noted, is almost non-existent. That places "Extraterrestrial" in a kind of cross-genre no-man's land, neither funny enough to be a praiseworthy farce nor dazzling enough to satisfy the Comic-Con crowd, who have to wait for the film's final image to see a single, modestly special effect. This kind of generic mash-up poses a challenge for marketing: How do you create a tag-line and a movie poster that accurately promotes a movie that can't be handily pigeon-holed? How do you simultaneously appeal to two distinctly different audiences, namely those who favor sci-fi spectacle and fans of rom-com chick-flicks? The movie doesn't pull that off, but Vigalondo deserves credit for straddling genres with well-drawn characters and a smart, well-chosen cast. Jenner and Villagrán are especially appealing in their quiet scenes together, establishing an easy, good-natured chemistry that's easy on the eyes and ears. Each character benefits from sensible arcs that give them admirable dimension, partially compensating for the alien-invasion questions that Vigalondo steadfastly refuses to answer. Like a magician, Vigalondo knows the value of misdirection, and those who enjoyed "Timecrimes" will continue to appreciate his penchant for keeping a few tantalizing tricks up his sleeve.